A new species of Escharinidae, Taylorius nyembezi sp. nov., is described and illustrated from material collected by the R.V. Meiring Naudé cruises at 90 m depth off the east coast of South Africa in 1979 and lodged in the collections of the Iziko Museums of South Africa, Cape Town and The Natural History Museum, London. The specimens were previously reported as conspecific with recent and fossil specimens from New Zealand and misidentified as Escharina waiparaensis (Brown, 1952) by Hayward & Cook (1983). Subsequently Gordon (2014) clarified the taxonomic status of the unique species that constitutes Escharina waiparaensis. In this paper we erect Taylorius nyembezi sp. nov., for the South African specimens based on its unique anter and sinus shape, metrics of its zooids and orifices, and the large size and position of the spine bases. Key words: Bryozoa, Escharinidae, Taylorius, new species, historical specimens, South Africa. The genus Escharina Milne Edwards, 1836, is one of the most diverse and taxonomically difficult genera of the family Escharinidae (Tilbrook 2006). This genus has been studied and clarified by a number of taxonomists, which include: Brown (1952), Buge (1957), David & Pouyet (1978) and Berning et. al. (2008). Several authors have erected new genera that were previously included in Escharina Milne Edwards, 1836; Herentia Gray, 1848; Therenia David & Pouyet, 1978; Phaeostachys Hayward, 1979; Bryopesanser Tilbrook, 2006 and Taylorius Gordon, 2014. Given the clearly weak characterization of Escharina Milne Edwards, 1836 further taxonomic research on this taxon is likely to reveal a number of cryptic generic taxa (Gordon 2014). The most recent genus to be erected that was previously included in Escharina is Taylorius based on the nature ofits pseudoporous frontal shield, regularly paired small heterozooids and setiform avicularian mandibles, fully cleithral ovicells and lack of a peristome. Gordon (2014) proposed new combinations for two fossil species, viz. Taylorius masoni (Brown, 1952) previously Escharina masoni and Taylorius waiparaensis (Brown, 1952) previously Escharina waiparaensis, and erected Taylorius cylindratus (Gordon, 2014) previously Escharina waipa-raensis, Taylorius arcuatus (Gordon, 2014) previously Escharina waiparaensis and Taylorius spinosus (Gordon, 2014) as a new species from New Zealand. The confused synonomy of Escharina waiparaensis was, in particular, dealt with comprehensively and clarified by Gordon (2014). Furthermore, he noted that specimens from South Africa and Australia require further taxonomic examination as his preliminary opinion suggested that these warrant placement in the genus Taylorius, with the African specimens representing a potentially new species. This study aims to give an account of a new species of Taylorius, Taylorius nyembezi sp. nov., from specimens collected by the R.V. Meiring Naudé; previously reported from South Africa as Escharina waiparaensis by Hayward & Cook (1983) and alluded to in Gordon (2014). The taxon described here was collected during the R.V. Meiring Naudé cruise, that was performed by the South African Museum's Department of Marine Biology in 1979. The biological material collected was preserved in a mixture of sea water and formalin and later transferred to 70% ethanol. Holotype and paratype specimens were assigned for historical specimens lodged in the collections ofthe Natural History Collections Department, Iziko Museums of South Africa, Cape Town, and The Natural History Museum, London, respectively. The taxonomic opinion and classification expressed below is based on the most recent opinion of Gordon (2014). nyembezi (isiXhosa) - tear; named for the characteristically teardrop-shaped sinus. Holotype: SAMC-A026610, SM239 - Eastern Cape, South Africa (32°14.8'S 29°00.8'E), depth 90 m, collected by the R.V. Meiring Naudé, 25 June 1979. Paratypes: NHMUK - 1983.11.5.56., SM239 - Eastern Cape, South Africa (32°14.8'S 29°00.8'E), depth 90 m, collectedby the R.V. Meiring Naudé, 25 June 1979; NHMUK - 1983.11.5.66., SM164 - Eastern Cape, South Africa (33°04.6'S 28°06,6'E), depth 90 m, collected by the R.V. Meiring Naudé, 26 May 1978. Colony encrusting, forming small, unilaminar, irregular patches. Autozooids broad and flat, rounded distally, weakly elongate-rectangular, occasionally wider mid-length or proximally [ZL 720-880 (794), ZW 440-640 (514)]; interzooidal boundaries indicated by a smooth, narrow, non-porous strip around the zooids. Frontal shield weakly convex, granular, with numerous relatively close spaced pseudopores; areolar-septular pores mostly absent, occasionally 1-2 per zooid along lateral margin. Orifice with distinct transversely D-shaped anter that is wider than long [OL 160-200 (178), OW 120-160 (140)]; sinus longer than wide with distal corners curving inwards and proximal end rounded; proximal margin of anter, upon which denticled condyles are set, slopes upwards towards the sinus opening, with lateral corners deeply notched; four equally sized large spine bases present with one shorter pair of spines positioned distally and larger pair positioned mediolaterally on either side of orifice. Small, paired, lateral-oral avicularia present at level of sinus; slightly oval-shaped with complete crossbar. One ovicell present; at the growing edge; ooecium appearing as a low bulge, the exterior skeletal surface cryptocystal, granular, imperforate; orifice distorted. Mural communication pores set low in lateral walls inset in buttressed recesses; distal transverse wall with 1-3 large multiporous septula. Ancestrula not seen in examined material. Taylorius nyembezi sp. nov. was first reported from South Africa as Escharina waiparaensis (Brown, 1952) by Hay-ward & Cook (1983). These authors noted that the South African specimens were interesting in that they were the only representation of E. waiparaensis outside of New Zealand, where this species was reported from the Miocene (Brown 1952) and Pliocene (Brown 1954), and as extant from Three Kings Islands, New Zealand, by Powell (1967). Hayward & Cook (1983) remarked that the specimens were 'identical' to the recent specimens (BMNH 1964.8.12.59C, 59D) reported by Powell (1967), which presumably they had examined. Subsequently Gordon (2014) erected six new species (viz., Taylorius arcuatus, T. cylindratus, T. incognitus, T. masoni, T. spinosus, T. waiparaensis) for the same recent specimens of the New Zealand material and together with the fossil species erected a new genus (viz. Taylorius). Gordon (2014) noted that the South African material reported by Hayward & Cook (1983) is potentially a new species with placement in Taylorius. Taylorius nyembezi sp. nov. is most similar to T. waipa-raensis, T. arcuatus and T. cylindratus. T. nyembezi differs from T. waiparaensis (see Figures 10H, 11A-C in Gordon 2014) in colony form, which is encrusting in the former and bilamellar-foliaceous in the latter, as well as in the metrics of zooids and orifices (see Table 1). The anter shape of T. arcuatus, T. cylindratus and T. nyembezi are all very similar, but the most obvious features distinguishing the latter is its relative long sinus (i.e. it is longer relative to total orifice length), the shape of the proximal margin of the anter (seen unequivocally with SEM) and the large size and position of the spine bases (see Figure 10F and G in Gordon 2014). These characters appear to have usefulness in species discrimination within Taylorius. No measurements were done on the ooecium and female orifice ofT. nyembezi,asthe colony was fragmented, and only one ovicell was observed towards the growing edge. These unique characters are considered sufficient to warrant erecting T. nyembezi as a new species. 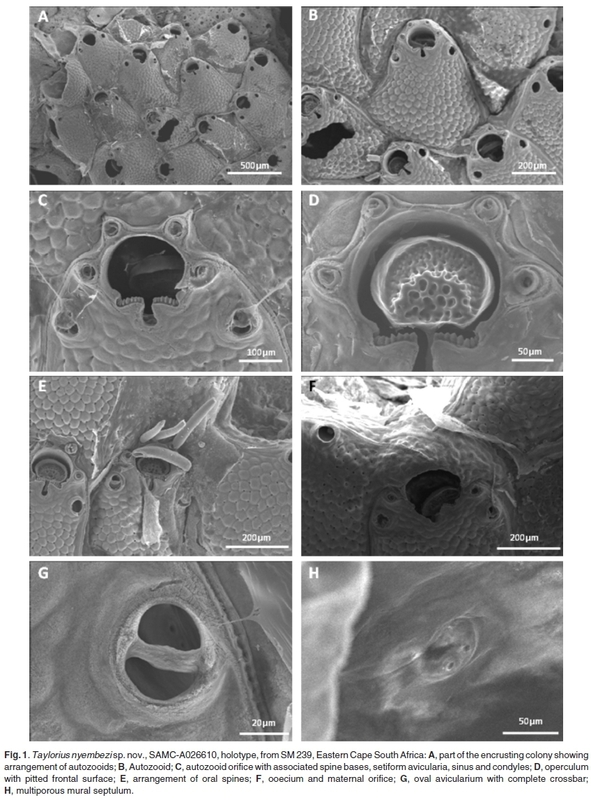 The authors are thankful to Albé Bosman for his valuable input and comments on previous versions of the paper and for assistance with SEM images. Candice Untiedt is thanked for comments on the manuscript. Elizabeth Hoenson and Mary Spencer Jones are thanked for access to specimens lodged at the Natural History Collections Department, Iziko Museums of South Africa, Cape Town, and the Natural History Museum, London, respectively. Lastly the authors are thankful to Dennis Gordon for his guidance and for providing a much respected opinion on the diagnosis.